Here I am..again remembering my blog . Happy Diwali to all! Diwali- The only time in the year I am motivated to cook sweets. It just happened that in my family all are spice lovers and none got a sweet tooth except for those chocolates. This is a recipe from our family friend -who is an excellent cook herself and an expertise in using locale items in traditional cooking. Yes you guessed it right- This is like my Kala Jamoon which also uses pancake mix. Mix the flours and butter till the butter is well incorporated. Sprinkle milk (Can use yogurt as well- I have had used both) and knead it like a roti dough. Let it rest for three hours. Make the syrup till 1 string consistency. Add food color at the end and squeeze lime juice to avoid crystallization. Let the syrup cool down. Make small similar sized balls out of the dough , place them between the palms, twist and make it a disc. Press a thumb in the middle . Fry these discs at medium heat just like we fry gulab jamuns. Drain , place in the syrup for three minutes and remove and line them up on a plate/cookie sheet. While they are hot , garnish the top with flakes of coconut/pistachios/saffron to your liking. Whenever I bake, I have my daughter running around the oven smelling, tasting, peeping, to say in short, குட்டி போட்ட பூனை மாதிரி. (like a mother cat who delivered in recent and goes around the house with her kittens often changing their place of stay ). At times, she will become over enthusiastic in helping me (too much some times)! So, when Trupti announced the ‘Little chefs’ event, I had a reason to include my girl in the spotlight. Even if not for this event, she is always my little judge for my cooking. I had tried few cookie recipes but not without egg. When I saw this eggless version, in Priya’s ‘Sugar and Spices‘, I was taken by the photo and immediately noted in my ‘to try list’. Then, I tried it one fine day, and it is our fave now. It kind of melts in your mouth, just like SKS mysorepak. I made these cookies several times, and made a little modification to my taste. Beat butter and brown sugar together with a stand mixer. Sift together the flour, cornstarch, salt, cinnamon and nutmeg. At a low speed, add dry ingredients to the butter, little by little, mixing only until they form a dough. Fold in the pecans atlast. Wrap the dough using a plastic wrap sheet. Roll it on the surface and shape it into a long log. Refrigerate the dough for 2 hours. Cut the log into 1/4 inch discs and bake at 350 deg F for 14 -20 minutes . The cookies are still pale when done , so don’t let the color decide the doneness. ‘Thinnai pechu veenaa pochu’ goes a famous tamil saying . It means that all chitchat is a waste of time. I agree, but in one such kind of gala chat I had with my friends back home, we started talking about food and it ended up like a recipe exchange workshop. I carried home this recipe , tried it and from then owned it in a special page of my recipe book. It is so rich in taste and perfect for a special occasion. By the way, have you ever had the problem with the kids spitting the full mouth of rice just for a spicy chunk or for a chilli peice? My daughter does it and I try in all my preparations to include the spices in a form she takes it. For this reason, I like to call this as a ‘no spit’ vegetable pulav. Take the dry ingredients in the spice list and grind first. This is important when using poppy seeds. Add garlic, ginger and chilli then and grind to a fine paste. In a big pressure cooker, heat oil and butter. When it is real hot, throw in the bay leaf and onions , saute well. When the onions turn transparent, add all the vegetable except tomato. Stir in for few minutes and add the masala. After a couple of minutes, throw in tomatoes and salt to wilt the tomatoes quickly. Add the cilantro and mint. Work on slow heat, by that time wash and soak the basmati rice. When the raw smell fades away, add the rice and stir slightly. Now add the coconut milk and water . Test the spice level and salt level. When the water comes to a boil, close the lid and cover the nozzle with a stainless steel tumbler. Keep medium heat. Turn off the heat after 10 long minutes. Wait for a while and open the lid to fill your house with the spicy aroma. Smell, see and eat! Enjoy! 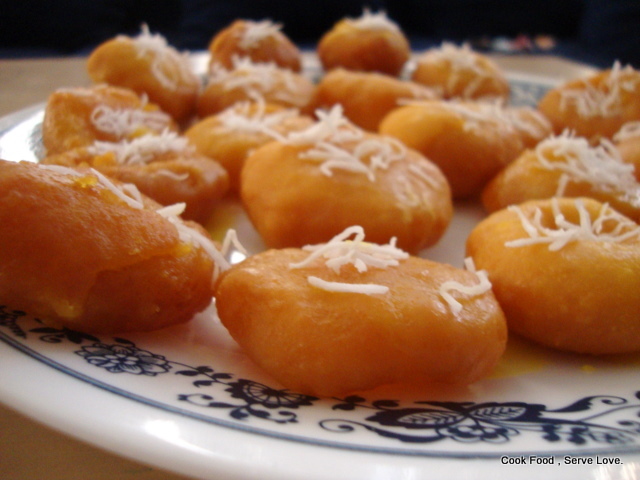 This is a fried snack my mom prefers to do for festivals, to pack for my brothers and for me when we leave to our hostels (during college days) and when we go on a long journey in holidays. Also great for an evening snacks. This is my modified version of the recipe whereas my mom soaks and grinds rice freshly in a wet grinder and add dall powder to it. Soak the gram dall in water for 1/2 hour. Grind the dry chillies first in a blender. Add peeled garlic pods next and fried gram dall atlast. Measure this flour and for 1 cup of this flour add 4 cups of rice flour. Take them in a large bowl, add salt, asfoetida, cumin seeds, sesame seeds and drained chana/gram dall. Mix the dry ingredients with the butter without any crumbles, and add water slowly . Mix till you can make a ball out of it. The dough will be like chapathi dough except for the elasticity. Heat the oil in a wide bottom kadai so you get the maximum surface area to do large batches of frying. Also ensure you heat good amount of oil .Whne you take smaller quantity, the oil gets heated up easily and regulating the temperature will be a tedious job by itself. Back home, my mom gets help from her house maids when one fries and others do the pressing. They spread a Dhoti (veshti) on the floor and take a small ball of the dough and press it on the dhoti by greased hands to get a thin round disc. When a batch is ready , it is fried in oil, on the both sides, till it turns golden yellow color. They are then drained and cooled before packing in air tight containers. Here in USA, I am a single woman army, so, I go for smaller batches of frying. I have no enough floor space in the kitchen and moreover my kids have no patience in seeing me work on the floor. So, I cut the edges of a few ziploc bags and pressed the dough in between the sheets. Since you do it like a sandwich, the thattais do not dry that fast and you need no oil for your hands. ‘Thank your mother, brother, father, sister or friend. Thank the weather or thank the farmer. Thank your neighbor’, says Meeta of What’s for lunch Honey. She asks us to dedicate a thank you dish for someone special. What a great chance! I came here in 28th week of my pregnancy and you can guess how worried would have been my elders back home to send me all alone. But, on the contraversy, I never had any separation depression or fear. All bcoz of my FRIENDS. They were helpful and so caring that I felt really at home. I never want to miss a single chance to thank them. Thank you, my friends, for being everything to me and helping me in my hard times. Hereby, I send this fabulous sweet as a dedication to all my friends for Meeta’s monthly mingle. Bring the butter to room temperature. Mix the pancake mix and milk powder with butter, then add water to make a soft dough. 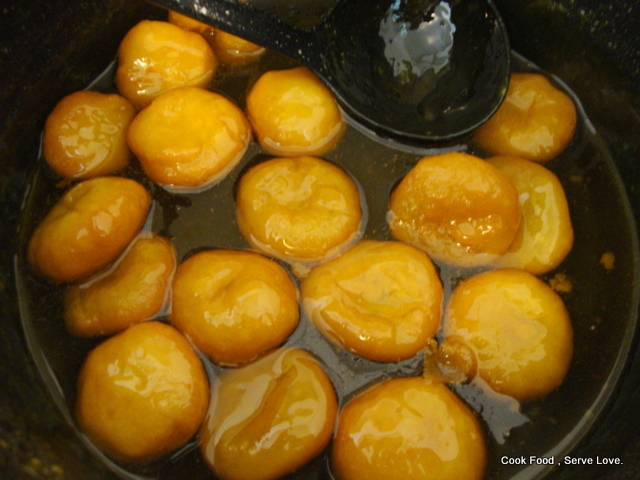 Make balls of uniform size and fry them in oil on a low heat. Dissolve the sugar in water, boil and bring to a 1/2 string consistency. Add cardamom .Soak the jamuns in the syrup till they absorp all the syrup.Serve with drizzle of honey on top. A must note about the taste- it is so addicting and your kids will ask for more and more. You wouldn’t believe I made three batches since diwali ,still my girl asks me to make it again. ‘Mummy, This is not fair’ grieved my daughter. She went ahead, ate half of it and rushed to school. I grabbed another serving and clicked my dish. I nodded, she went and fetched her own leftover from the fridge , microwaved and ate all by herself. Thats the power of taste . I learnt this dish from my chitthi (mother’s younger sister) and is always my rescuer when I am late to get up in the morning. Wash the rice once and soak for 10 minutes. Chop the onion finely. Peel and chop the potato into 1 cm cubes. Grind the last 7 items in the list into a fine paste. Heat oil + butter in the pressure pan. Sputter fennel seeds. Saute the onion. When it turns transparent, add potato , peas, mint leaves and ground paste. Add salt, tumeric powder, chilli powder. Saute till all oil comes out. Add the rice and fry slightly. Pour 4 cups of water. When the water boils, cover the pressure pan and cover the nozzle with a tumbler instead of the weight. Cook on medium heat for 12 minutes. This gives similar result of a dum briyani.Garnish with cilantro and roasted cashews. Serve with raitha/coconut chutney. Anyway, I learnt a way how to tickle my girl’s hunger. So, for the moms who want to impress thier kutties, here is the illustration for the rosy tomato.Peel the tomato with a knife and take care not to break the continuity.Gently coil from one end, spreading as you proceed. In our home, nobody eats it , so today’s rose will be in tomorrow’s salad/raitha. Hello, just a second , don’t get confused whether you have landed in a wrong blog. It is me relaxing on my sofa, remembering the good old song of my school days. This is the song I sing to myself whenever I am waiting especially at the crowded bus stops in Chennai. Just like this song, I have special songs for every occasions. My mom hums sweet telugu tunes while she cooks. Those are great tunes which none would have ever heard except her stove and vessels. Hey that gives me an idea!! Why don’t we play a meme game with this ? At the latest , ‘partha mudhal naalai’ from ‘Vettaiyaadu Vilaiyaadu’ is the hit in our kitchen kacheri. Now you tell me the most frequent song/tune/ slogam you hum/recite while you cook. I tag my favourite bloggers Indira , Menutoday , Vee , My Dhaba, and Saffron Hut. Powder the fried gram dall and the chillies in the blender. Mix the flours ,cumin seeds, asfoetida, sesame seeds ,butter / oil , salt with water.Load the dough into a murukku press. Make long strips on a greased plastic sheet/ ziploc bag simultaneously coiling them into spirals.Deep fry in oil on both sides. Murukku press – Much easier than the old styled press.